The scent of ‘tropical fruits, sugared oranges, lemons, and limes, redolent with lightly exotic mountain greens’ filled the air. No, it was not from the fresh Santa Cruz mountain air, but of the ‘Volcano’ candle I left in the car. The weather had been strange this winter – unseasonably warm, followed by rain and cold. The sun finally came after a week of rain. It was late February, and the Santa Cruz Mountains felt crisp. I was driving on Highway 17 heading towards the Monterey Peninsula. I’ve always taken this same route to take the kids to Santa Cruz boardwalk during spring break or play tour guide to relatives and friends to Monterey and Carmel. This time, I had one purpose in mind – to get some sand from the beach in Carmel, so I could copy the candle display at the specialty shop where I bought the ‘volcano’ scented candles. Leaving the Santa Cruz Mountains and the town of Capitola behind, I passed a stretch of farmland, slightly naked and covered in patches of fog. This stretch of farmland is normally covered in strawberry plants in late spring and artichoke plants in summer months. I felt a sudden burst of energy as soon as the stacks of the Moss Landing Power plant became visible – a sign that Monterey Bay is just a few miles away. I would soon be greeted by the spectacular ocean view. I reveled in the pleasant memories of family outings to Monterey many years ago: buying strawberries and vegetables from the fruit stand along Highway 1, soaking in the spectacular views of the ocean and the rolling Pacific coast line, dipping toes in Monterey Bay, and watching the elephant seals and otters at play, taking the kids (including my 3 year old nephew, JJ) to the movie at the old town, joining a Greek line dance at the Old Custom House Plaza during a Greek Festival. When I got to Monterey, I noticed patches of fog started to roll out, but I still felt the cold air. I decided to stop at Fisherman’s Wharf for lunch. I thought the clam chowder would be great to fight off the cold. Looking into the ocean, I saw glimmers of light resting upon the gentle rock of small commercial fishing boats. I felt nostalgic of family trips to Monterey. Back then my family would drive to Monterey to buy fish heads for making fish‘cocido”. I remember how everybody complained about the morning fog as we hiked from the parking lot to the wharf, yet encouraged to walk the long stretch of the parking lot as there would be warm clam chowder and the fresh ‘catch-of-the-day’ waiting at the wharf. We would stroll and picnic at El Estero Park after the fog gave way to a clear blue sky. The picnic food consisted mainly of sourdough bread, sea-food salad, and fast-food (bought from McDonalds across the park) for the kids. The notion that we would drive from San Francisco to Monterey for fish heads seems funny now. I thought it was a great excuse for a family getaway. I resumed my drive after a quick stop at Fisherman’s Wharf. I set off along Del Monte Avenue which led me to Cannery Row – the most popular tourist area in Monterey. This area is mainly associated with John Steinbeck’s novel “Cannery Row” and still redolent with images of Steinbeck's literature. This strip of road used to be called Ocean View Avenue but renamed Cannery Row in honor of the book. Visitors today poured into the area to see the Monterey Bay Aquarium. I think the Monterey Bay Aquarium in the greatest aquarium in the world because it is an invigorating model of ecotourism, where the indoor blends with the outdoor environment. The aquarium includes viewing decks that allow the visitor to spot, perhaps, a gray whale from Monterey Bay. Not to worry if you missed seeing a whale from the surface of the bay for almost all of Monterey’s sea life is represented inside the aquarium. Kids can touch the rays and play with the small sea critters in the open pool. Passing rows of seafood restaurants reminded me of my last trip to Carmel where we stopped to eat at the Fish Hopper’s Restaurant. While eating, we were able to see the sea lions and otters at play. And a few steps away from the restaurant, we were able to dip our toes in the water. I was always drawn to Monterey’s physical appeal and natural environment that it never occurred to me to associate Monterey as a place of history and culture. Today, without the pressure of having to play tour guide to relatives or friends, and to cover all the fascinating things to see and do, I felt a sense of relaxation. My road trip evolved into a literary reflection. For the first time, I took notice of this strip of road from a historical and cultural perspective. As I passed the quaint hotels and rows of seafood restaurants, I was reminded of the novel “Cannery Row”. Certainly, the Cannery Row today is far from the raw life depicted in the novel but still reveals the extent to which Steinbeck based his literature. For example, the Lee Chong’s Grocery Store (now a souvenir shop), the brothels described in the book (now restaurants), and the Western Biological Laboratory (now Pacific Biological Laboratory) remain in place. It is thought that Ed Ricketts, who pioneered marine biology in the area, may have inspired the Monterey Bay Aquarium. Cannery Row ends at the Monterey Bay Aquarium and becomes David Ave. When I reached the end of Cannery Row, I made a slight turn onto David Ave and followed the coastline along Ocean View Avenue that would thread through Pacific Grove and 17-Mile Drive to Carmel. However, after driving for 5 minutes, my body felt weak. I pulled to the side of the road and found myself at Lover's Point in Pacific Grove. The view here is just as spectacular as the scenery from the 17-mile drive to Carmel. The spectacular view reminded me of my last road trip to San Simeon. 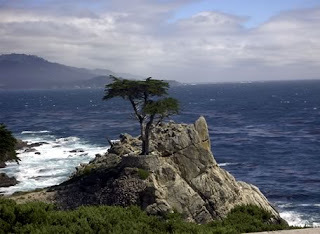 That drive started on Ocean View Avenue to 17-Mile Drive to Carmel, then on to Highway 1 to Big Sur and San Simeon where the road followed every bend along the crashing coast for miles and miles. It was one of the most memorable road trips of my life. This coast has been described in Steinbeck’s literature and the book, “1,000 Places to See Before You Die” as a natural wonder. I felt a sense of satisfaction knowing that not only I had driven the most exciting drive in the US but shared that experience with others. I decided to end my drive at Lover's Point. Before returning home, I sat in the car for a while and watched the flock of seagulls sitting on the rocks. The rocks were covered by seemingly lifeless black birds not bothered by the crashing waves. I became fixated with the landscape - the rocks served as the backdrop to the wide expanse of sea; the black color complemented the blue waters; the seemingly lifeless birds provided contrast to the crashing waves. It occurred to me that everything was part of the landscape that a painter would capture in canvass. Likewise in literature, the greatest inspiration for a writer comes not only from the beauty of nature but the truth. I pondered on the opening line of Steinbeck’s novel, “Cannery Row”. Steinbeck wrote, “Cannery Row is a poem, a stink, a grating noise, a quality of light, a tone, a habit, a nostalgia, a dream". Then it hit me. It was here in the Monterey Peninsula where many of the great themes of John Steinbeck’s literature were shaped.